We really want our new franchisees to run fabulous classes, enjoy Moving and Shaking and achieve success. One thing that can boost business immensely is running children’s parties on top of regular weekly classes. Our highly popular parties are themed according to the birthday girl or boy’s preference and are always loads of fun. They can provide an extra source of valuable income to a business that is already lucrative. ‘Abi was fantastic and all the parents commented on how lovely the entertainment was. The babies all seemed to enjoy themselves and the length of the entertainment was spot on. My son genuinely had a fab time, he was dancing away!! Definitely a big thumbs up! Many thanks & I’ll definitely be recommending a Movers and Shakers party to everyone! We want to make it even easier for our new franchisees to hit the ground running, so we’ve come up with an amazing summer offer for new franchisees: anyone who signs up to buy a Movers and Shakers franchise by the end of July will win a fabulous SPEAKER SYSTEM! The system comprises two great pieces of equipment worth well over £300! With this powerful yet easily portable system, any Movers and Shakers Franchisee will be able to run parties and events in big halls and still be heard over the noise of chatty parents. So don’t delay, find out more about a Movers and Shakers franchise and sing your way to success with our winning formula. I started Movers and Shakers back in 2009, and it became such a huge success story in my local area that I wanted to expand. After doing some research I decided that a franchise model was the best way to achieve this, but I wanted to make sure that any potential franchisees would be able to replicate my success in their own area. So I started searching for my first guinea pig! Erica Bartrum had all the qualities I was looking for in the perfect franchisee: a warm and bubbly personality, a confident singing voice and a strong business sense. She became my ‘pilot franchisee’ just over a year ago. Erica recently sat down for an interview to talk about her experience of running a Movers and Shakers business franchise. Her positive and inspiring answers will give anyone confidence that Movers and Shakers Franchising Ltd has a wonderful future ahead of it! I’m now searching for my next few franchisees, so please contact me if you think it might be right for you or if you’d like some further information. Has owning a franchise been good for you? Absolutely! I really love being my own boss, but it’s great having the support of the franchise and all the materials and advice that comes with it so I wasn’t starting a business on my own from scratch. When I was at school, I used to want to run my own performing arts school; I always knew I wanted to be my own boss. Once I found Movers and Shakers, I realised this was the dream job I’d always wanted! The biggest complaint of franchisees is that they aren’t given enough support. Do you feel you were trained properly and given enough pre- and post-launch support? Very much so! Gabi gave me lots of support and training in the lead up to launching. Gabi has always been only a phone call or email away whenever I need advice or support, which is so helpful when starting your own business. How long did it take before you started making a profit? I broke even on the franchise costs after only four months of trading. Do you feel you are making great money out of your franchise? Yes I do, for the hours I work I feel I earn enough. I earn a steady wage from this which is great after years of freelancing as an actress and drama teacher! In terms of expanding and moving forward, I would like to be able to afford to hire another teacher so I can share more sessions out among employees and take Movers and Shakers to more local nurseries and children’s centres. How many hours each week do you work on your franchise? It depends how many sessions I run each week; on average it’s between twenty and thirty hours a week. This includes all admin work and travel to and from venues. I feel I’ve been very lucky as my classes have built up well. The biggest challenge so far has probably been finding and securing stable venues that don’t charge too much to rent out their space so I can still make a profit from the classes. Also, making sure I look after my voice as there’s lots of singing involved and it’s easy to lose your voice is you don’t take breaks and rest. What’s your favourite part of running your own business? Having the freedom to make decisions about what hours I want to work. It allows me to choose which sessions I want to teach myself and gives me flexibility to take holidays and arrange cover so the business can run when I have time off. What’s the most rewarding part of being a Movers and Shakers franchisee? Definitely seeing all the babies and toddlers’ faces enjoying the class, all the parents smiling and singing along to the songs and knowing it’s my job to entertain them all! It’s a great feeling when you have a couple of really fun sessions, it actually doesn’t feel like work when it’s so much fun. A bonus is coming home knowing you’ve made a good profit and being finished for the day before 3pm! If you could give advice to someone starting out, what would it be? Most importantly, you have to fall in love with the classes in order to really love this job. Then it will all be worth it and you’ll have the most rewarding job in the world. Save as much as you can before you start so you can enjoy the first six months without too much pressure on yourself to earn too much, that way you can focus on making your classes really good and popular. After all, word of mouth is the best form of advertising. Also spend time finding secure venues that will be the perfect location for classes – this is not always easy, but once you find the right venue it’s really rewarding. Be prepared to run some free taster sessions/small classes to get the word out there. Once people find out about your Movers and Shakers classes, they will quickly realise how brilliant it is for their children! If you were to do it all over again would you choose the same business and the same franchisor? Absolutely – I have loved every minute! It’s tiring some days but always rewarding and fun. I always feel like I’ve accomplished something to be proud of when parents are so grateful that I have entertained their little ones at classes and birthday parties. Movers and Shakers is a brilliant concept, and Gabi has supported me throughout the process 100% – so no regrets at all. If you would like to find out more about matching Erica’s success story in your own area, please contact us for more information. It’s Monday morning – argh! You have a very short window in which to feed your kids their breakfast, get them into the car and to the childminder, grab a croissant for breakfast, hop on the tube (and spend the 30-minute journey cramped between two people), get to work and spend the day in the office wishing you could work from home, do something you love and spend more time with your children! feel fulfilled and bring in a rewarding income for your family. What is this magical job? It’s owning and running a Movers and Shakers franchise! You can work for yourself. Say goodbye to bad boss days. You will have our team on hand to deal with the difficult aspects of starting a business – allowing you to hit the ground running on Day 1. You will have fun running a Movers and Shakers franchise. Seeing children’s delighted faces every day is a recipe for fulfilment. You will be able to put the full range of your skills to use, from singing and teaching to planning and marketing. You will have our full support. Our package includes all the materials and equipment you need to provide Movers and Shakers classes, as well as high level creative and business training. You will be able to draw on our fabulous market base. There are always mums looking for great classes to bring their babies and toddlers to, and Movers and Shakers is rated highly and well loved for its easy booking system, low cost and amazingly fun and interactive classes. If you want to find out more about this exciting opportunity, please don’t hesitate to send us an email. As many of you know, we have now started the process of franchising Movers and Shakers. It’s a complicated step for any business, so to make sure we got it absolutely right, we worked closely with a Franchise Consultant. We are confident that we are offering a brilliant opportunity for a creative person with a good business brain. Our first franchise is up and running and doing even better than expected. There are countless franchises out there. The latest trend is to market them at women, particularly at mothers. We belong to the generation of women who were promised the world! We were told we could be businesswomen AND have our own families. When we grew up, we realised that it wasn’t quite as simple as that. There are so many compromises that have to made. Buying the franchise for a successful company is one way of owning and running a business while fitting your working life around the school day or other childcare arrangements. The decision to acquire a franchise should not be taken lightly, and we really recommend that you get in touch with companies like mumsinfranchise.com and workingmums.co.uk, who will give good advice on all aspects of franchising. 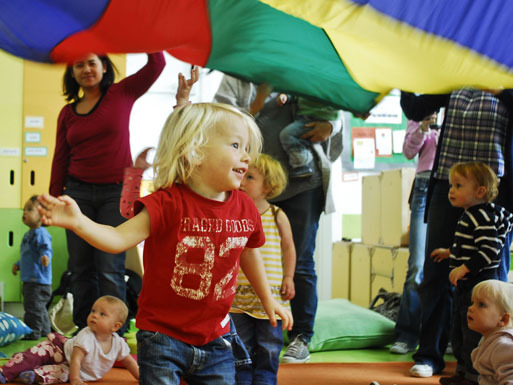 There are plenty of franchises on offer for baby and toddler groups; party companies; music, dance, gymnastics and sports classes; educational groups; you name it! If you are interested in going down the franchise route, we’d love you to consider a Movers and Shakers franchise. We are at the beginning of our journey, and we’re looking for an amazing team of franchisees to build up a national brand and identity. We were recently featured on the Mums in Franchise website – you can read more by following this link. And if you’d like to register your interest in a Movers and Shakers Franchise, please visit the Franchise Opportunity page on our website. Some of you may have noticed that something is afoot in the wonderful world of Movers and Shakers: a new logo, a new website, beautiful new instrument bags at our classes… What’s going on? Well, I’ll tell you. Up until now, Movers and Shakers has been operating under the wing of our other company, The Playing Space, which offers speech and drama education to older children. But Movers and Shakers is now a company in its own right, and this has happened largely because on 1 November we are launching our very first franchise! That’s right, we are spreading the joy beyond Haringey, and into Barnet and Southgate. When I started this company back in 2008 it was meant to be a little sideline, a ‘pocket money’ job to keep me busy while I looked after our second baby. It has grown far beyond anything I ever anticipated. From the beginning, it was clear that – in a saturated market – I had found an approach that offered something unique. For whatever reason (I can think of lots – you can read about some of them in a previous blog) parents and carers were choosing to bring their child to Movers and Shakers instead of (or as well as) sessions offered by other companies. By the start of 2013, we were running twenty sessions each week, and most of those were full or nearly full. We were still receiving calls from venues further afield requesting us to run sessions, but I realised that it would be detrimental to the classes already running if I spread my focus too wide. With more than 300 children attending Movers and Shakers each week, managing the bookings and keeping everyone happy was already a full time job. The obvious next step was to franchise the company and create Movers and Shakers territories that would each be run and nurtured by their own business owner. I wanted to keep the Alexandra Palace territory (which includes Crouch End, Stroud Green, Highgate, Muswell Hill, and Bowes Park), but I decided that anything outside that zone was up for grabs. I was delighted when Erica Bartrum (who already worked as a drama teacher for The Playing Space) expressed an interest in becoming a franchisee. I knew Erica well and could see that she not only had a fun bubbly personality – ideal for running brilliant sessions – but was also highly organised and intelligent and a really good communicator – perfect as a business owner as well. Erica and I have been working together for the last couple of months, and she has been running some fabulous classes as well as receiving training in all the behind-the-scenes business stuff. I know she is going to run a brilliant franchise in the Barnet and Southgate territory. She inherits a couple of classes that I had already set up in Palmers Green and Southgate and is starting up loads more of her own! I’ll end by saying that I am really looking forward to introducing our second franchisee at some point. Who knows when that will happen or who it will be? If you know someone, or if you yourself are interested in running your own Movers and Shakers business, then please get in touch with us, and I could be writing about you in a blog in the not too distant future!